I have not read David Sehat’s new book, but based on his previous book (The Myth of American Religious Freedom) I am very excited to see that he has a new book out. His new book focuses on exposing the contradictory and contentious nature of the politics of the Founders, thus making them unsuitable as infallible guides to present politics. 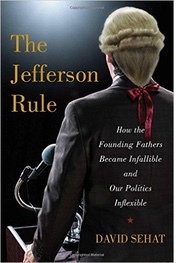 Read the entire review here: History News Network | Review of David Sehat’s “The Jefferson Rule: How the Founding Fathers Became Infallible and Our Politics Inflexible”.